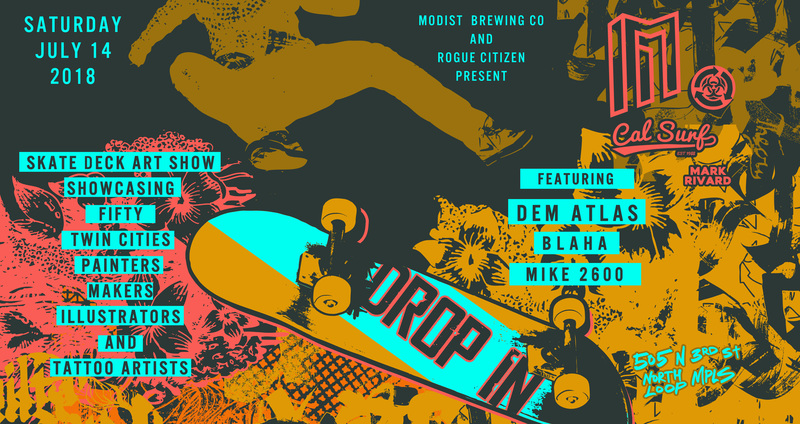 Drop In Skate Deck Art Show - Modist Brewing Co.
Once upon a time, Modist and Rogue Citizen decided to give 50+ Twin Cities painters, makers, illustrators, and tattoo artists the same exact canvas (a skateboard deck) and asked them to make something radical. Then they did. Drop In Skate Deck Art Show is back for 2018! Come check out over 100 tricked out skateboards on display at Modist beginning on July 14th, catch live music from Dem Atlas, BLAHA, and Mike 2600, and catch a live skate demo from some of the area’s best. Big thanks to Cal Surf and Mark Rivard for supplying the boards. RSVP HERE, then come here.